A games developer who had to leave her home after receiving threats at the height of the Gamergate furore has set up a support group for other victims. Zoe Quinn said abuse online was seen as less serious than in the "real world". She said her group, Crash Override, helped people to prevent attacks online, as well as to deal with them when they did arise. Caroline Criado-Perez, herself a victim of online abuse, said she would have "loved" such a service. "I am grateful to her on behalf of women who are going to go through this and who cannot protect themselves. A lot of people are not internet-savvy, but their abusers are," she said. 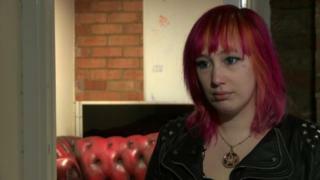 Zoe Quinn became the target of harassment after details of her private life were released online by an ex-boyfriend. It was claimed that she had had a relationship with a gaming journalist, sparking what became known as Gamergate. Its adherents said the movement was about journalistic ethics. Others said the most common targets for abuse were women and that it was a front for misogyny, which many Gamergaters denied. In October last year, Ms Quinn told the BBC that she was keeping a file containing the names of women she said had left the gaming industry as a result of the abuse. And, while she had seen women being attacked online before, she said, Gamergate had been "the straw that broke the camel's back", convincing her to set up the help group Crash Override, which is being run with games producer Alex Lifschitz. "There's websites that are institutions to perpetuating this kind of online mob abuse, so it's not like this is new," she told the BBC. Both she and Ms Criado-Perez, who was targeted after campaigning to put a picture of Jane Austen on £10 notes, agreed that there was a damaging perception that online abuse was less severe than that occurring in the "real world". They also said that many law enforcement agencies did not understand the technology involved. Ms Quinn said Crash Override monitored sites online where people were known to gather to coordinate attacks. She pointed to one case in which she said her group of volunteers - all of whom have been victims of similar attacks and have asked to remain anonymous - had been able to warn police that an attack was being planned. She said that a "swatting" - where a call is made to police in the hope that they will send officers to the target's house - had been in the offing. As a result, she said, officers had been able to "de-escalate" the situation. Ms Quinn said that she first began gathering intelligence on how mobs of people grouped together online to harass their targets when she was being attacked herself. She said that others had described such similarities in the tactics used against them that it had become clear the attacks were systematic and coordinated. That, she said, allowed the group of volunteers to "map" expected attacks. The journalist Andrew Todd said he had been able to watch people "discuss how best to ruin my life" on a message board after writing an article critical of the Gamergate movement. "It's a very violating thing having your whole identity get pored over," he told the BBC. He said that Crash Override had advised him on how to secure his online accounts, to inform the police of any potential threats and prevent any further attacks. He said it had also provided him with emotional support. The group is not seeking any funding but acknowledged its resources would limit its capabilities. It was providing its service free to anyone who feared becoming a victim of an online mob, particularly those seeking to "dox" them - or release their most personal details online, Ms Quinn said. Other groups offer services for people who feel they are being harassed, but few focus specifically on coordinated attacks by online mobs. Get Safe Online, for example, said it had been studying the issue but had not yet launched a specialised service.